Allspice is ground from allfruit which grows from the mighty allspice plants of Allland, the realm of perfection. Unfortunately, it doesn’t taste very good on cereal. This entry was posted on Monday, February 15th, 2010 at 12:00 am and is filed under Comics. You can follow any responses to this entry through the RSS 2.0 feed. Both comments and pings are currently closed. I have to ask… Is this based off personal experiance? The last comic was. I think there actually was someone behind me while I was going off about allspice. I didn’t buy any though. Heh, keep up da good work guys. I haz come back after not posting for a while. 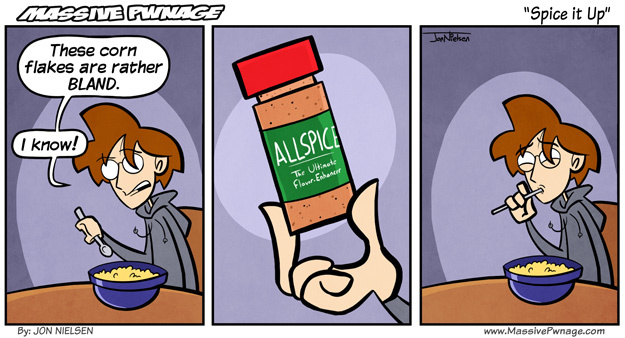 Try using “Allspice” in a comic where imp gets powers off of it or somethin. Heh, the imp getting powers from allspice? that sounds hilarious, i mean, what would the imp do, bring back Locke? Sorry for the (tri?) dupe comments, my internet is lagging hard. What would the imp do, bring back Locke? that would be funny, to say the least.